The Amsterdam Mohawks used stellar pitching from their starting pitcher Peyton Plumlee (Miss. St.) and their bullpen to shut out the Albany Dutchmen, 2-0, at Shuttleworth Park on Friday night. 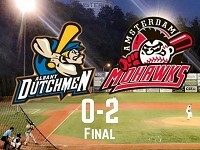 Amsterdam gave up only 2 hits to the Dutchmen and did not surrender a hit for the final 7 innings. Plumlee went 5 innings, giving up only two hits while striking out 9 and walking one. Ryan McLinskey (Seton Hall) and Ryan Falls (Marshall) combined for 4.0 innings of no-hit ball, striking out 6 and walking none. Greg Marino (Stony Brook) went 5.2 innings for the Dutchmen in a losing effort, giving up one run on three hits, walking two and striking out a game high 11. The game was a pitching duel from start to finish, with the only runs coming on a Richie Barrella (Manhattan) RBI fielder’s choice in the bottom of the 6th and a Sam Praytor (Alabama) RBI single in the bottom of the 8th. McLinskey gets the win for the Mohawks, while Marino is saddled with the loss. Ryan Falls is credited with the save. The Mohawks will travel to Cantine Memorial Field tomorrow to play the Saugerties Stallions, with first pitch slated for 7:05 PM. Albany will travel to Damaschke Field tomorrow to match up with the Oneonta Outlaws, with the first pitch also set for 7:05 PM.